Opencart Marketplace Per Country Per Product Shipping : Opencart Marketplace Per Country Per Product Shipping will allow sellers to add Shipping to each country according to the product. The seller and admin can add shipping price for each product according to the country from the product edit page. The sellers and admin can upload shipping details with the use of CSV file. Opencart Marketplace Per Country Per Product Shipping : Opencart Marketplace Per Country Per Product Shipping will allow the sellers to add Shipping price for each product according to the country. The seller and admin can add shipping price for each country from the product edit page. The sellers and admin can also upload the shipping details with the use of CSV file. Sellers can add shipping price for each product according to the country. Sellers can upload shipping details using CSV file from their account. CSV file needs product ID, country code and shipping price only. Shipping method is visible on order. 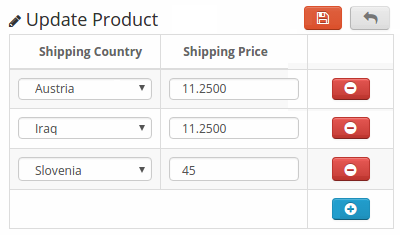 Admin can add shipping price for each product according to the country. Admin can add shipping to any product in the store. Admin can upload shipping details using CSV file. The total shipping price is visible on the checkout page. After the installation of the module admin can configure the module and enter the title, method title, error message and the default price for the shipping method. Admin can add country and shipping price for their and for the seller's products. Admin can enable/disable the shipping method. Admin can allow countries for which the shipping method is applicable. Admin can enter default shipping price which will be applicable for all countries. Sellers can manage the Marketplace Per Country Per Product Shipping from their account. The sellers can add shipping while creating new products or by editing existing products. Sellers can select each country and enter shipping for that country. Sellers can add shipping to each product. Sellers can select the country for which they want to enter shipping price. The sellers and admin can upload the or add the shipping price for their product with the use of a CSV file. Sellers can upload the CSV file with product ID, product name, country code, country name, and price. 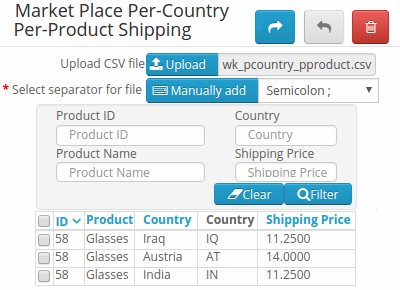 Sellers can add shipping price and country to their products with the use of CSV file. 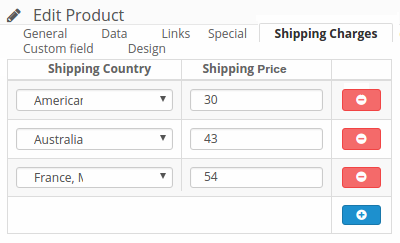 Admin can add shipping price and country to all products with the use of CSV file. * Fixed one language issue for all opencart version. Did you buy Opencart Marketplace Per Country Per Product Shipping ?